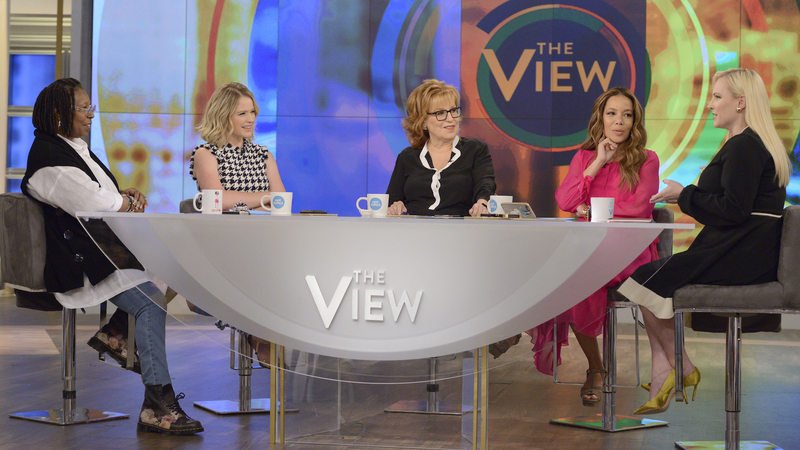 The View has long had a rotating cast that has brought together a mix of heavy-hitting journalists, cultural pundits and politically minded movers and shakers to gather around that iconic table and debate the hottest issues of the day. Because of this rotating cast, viewers of the show have gotten to know a great many female cohosts over the years — but they've also had to say goodbye to a fair few of them as well. As of Monday, it looks like viewers will be saying goodbye to yet another member of The View, who is leaving the show and moving on to an exciting new project on another iconic morning television show. Earlier on Monday, Sara Haines announced on Twitter and Instagram she will be leaving The View and heading over to Good Morning America to cohost the program's third hour with Michael Strahan. ABC also announced the arrival of Haines, including a special announcement video that both Haines and Strahan posted on their respective Instagram and Twitter accounts. The video, which we pulled from Haines' Instagram, is a fun, irreverent announcement video. Strahan leads things off, teasing that both he and Haines will be taking over GMA's newly acquired third hour (taking over the slot previously occupied by The Chew) for a program called GMA Day. The series is set to begin on Monday, Sept. 10. Specifics about the focus of the series are still being kept under wraps. Ahhhhhhhh!! Not even sure I can find the words to adequately express how excited I am to sit next to @michaelstrahan as we embark on this new journey at @GMA #GMADay…it is (and has been) a dream of mine for a LONG time. It’s bittersweet though as I leave @theviewabc, a place I have called home for the past couple years. A huge thank you to all the viewers and fans who have followed me along the way. I LOVE my View family, but don’t worry, my brand new *view* is literally down the street. Haines began her time on The View as a guest cohost in 2014 and was later promoted to a regular cohost in 2016. She has also popped up on other ABC network programs, notably GMA's weekend edition, so this lateral move feels like a great fit for her. She certainly sounded excited in the caption for the announcement video when she wrote, "Ahhhhhhhh!! Not even sure I can find the words to adequately express how excited I am to sit next to @michaelstrahan as we embark on this new journey at @GMA #GMADay…it is (and has been) a dream of mine for a LONG time." Haines went on to thank her coworkers and fans from The View too, commenting that "it’s bittersweet though as I leave @theviewabc, a place I have called home for the past couple years. A huge thank you to all the viewers and fans who have followed me along the way. I LOVE my View family, but don’t worry, my brand new *view* is literally down the street." Haines' departure from The View opens up a second spot on the show's core cast of cohosts, as it was also recently announced that cohost Paula Faris would be leaving The View and GMA to pursue her own personal projects while reporting for ABC. There's no word yet on who will be replacing Haines and Faris, but goodness knows we're excited to see what's next for both of them!